Perhaps one of the lesser-known, but certainly interesting, visitor sites in Puglia is the Altamura Man Visitors Center, in the town of Altamura in the Province of Bari. That’s because it houses a fascinating collection focused on the “Uomo di Altamura” (“Altamura Man”), a prehistoric human skeleton discovered in 1993 in a in a limestone cave, the Grotta di Lamalunga, outside the city. Long thought to be a homo sapiens dating back approximately 130,000 years, recent DNA testing has confirmed that the “Uomo” is in reality a Neanderthal man who is 150,000 years old. Visitors are not permitted to enter the cave where the skull and bones of the “Uomo” reside. Rather, they can learn about him and way in which he was discovered through lectures, presentations and exhibits in a “virtual museum” at the Altamura Man Visitors Center at Strada Provinciale, number 157. The telephone number for reservations is +39 339 6144164; check the website for hours of operation. Admission is 2.50 euros for adults and 1 euro for kids under 12 years of age. Last year, the center attracted nearly 6,000 visitors. I’ve updated the News page on my website to feature a variety of news articles I find that relate directly or indirectly to Puglia tourism, especially topics involving travel programs and tips, history, culture, food and wine, and sustainability. I hope you find the updates interesting and informative. Click here to go to the News page. If you have any relevant news to share, please comment on this blog or email me at info_puglicaonnection@yahoo.com. Grazie! How’s this for an interesting way to draw attention to the uniqueness of Puglia: The famous trulli houses of Alberobello are featured on a French 83-cent stamp. 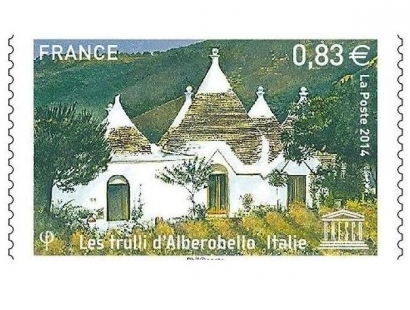 The UNESCO World Heritage Site (one of three in Puglia) is represented by a group of trulli, the characteristic stone houses of Alberobello, one of the most-visited places in the region. Some 500,000 of the stamps were printed. 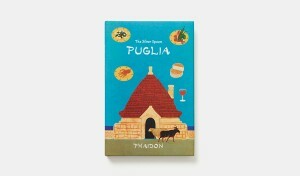 Press release: Puglia is the latest title in the Silver Spoon regional cookbook series, building on the success of Tuscany and Sicily, published by Phaidon. Featuring more than 50 simple and authentic recipes from the Silver Spoon kitchen, Puglia is a culinary journey through a fascinating area of Italy. Each chapter examines a single province, with fascinating narrative texts that examine the key produce and ingredients found in each area, such as creamy burrata from Andria and mussels from Taranto. The book features beautiful and diverse landscape of the region, its produce and people and each recipe is accompanied by a stunning image of the finished dish. Also included is a year-round calendar of food festivals. Puglia is the third title in the popular regional Silver Spoon cookbook series (after Tuscany and Sicily) and provides readers with a culinary insight into Italy’s best-kept secret. Explore one of Italy’s best-kept culinary secrets and hottest new travel destinations with the latest addition to Phaidon’s series on regional cuisines compiled from The Silver Spoon. Puglia offers more than 50 all-new, authentic and easy-to-follow recipes from The Silver Spoon kitchen that showcase the full culinary range of one of Italy’s most distinctive regions. From simple antipasti (fried mussels) and classic pasta dishes (orechiette with turnip tops), to delicious desserts (chocolate with figs), home cooks will be immersed in the food culture of one of most fascinating areas of Italy. Gorgeous specially commissioned photography of landscapes and regional products compliment the recipes and texts, which explore the province’s unique culture, key ingredients, producers and food markets. The traditions surrounding the celebration of St. Joseph’s Day (Festa di San Giuseppe) in the old town of Monte Sant’Angelo are highlighted by concerts and the burning of the “Fanoje San Giuseppe,” wooden towers constructed throughout the town. 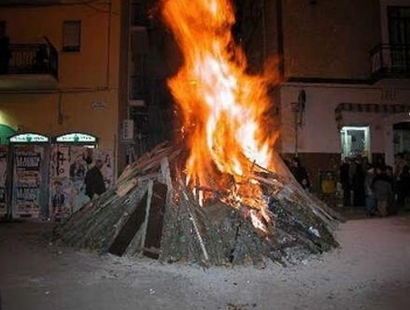 The bonfires are considered a rite of purification and are sponsored by the town’s Assessorati alla Cultura e al Turismo and other local entities. Read about the celebrations here and see a video of a Fanoje San Giuseppe here. You are currently browsing the Puglia Connection Blog blog archives for March, 2015.